Occupied was a very unique read. I wasn't really sure what to expect. Based on the cover, I probably wouldn't have picked this book up, but I am glad that I got a chance to read a copy for free with the Read & Review Program. 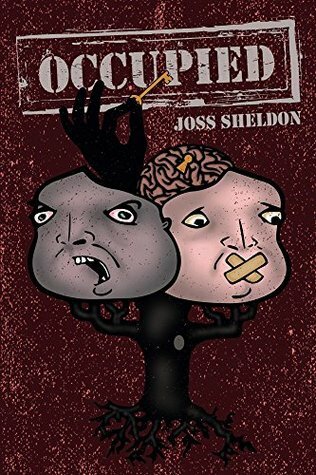 Joss Sheldon has written this book in 3 stages of life: Child/Adolescent/Adult. From there we are told 4 different characters stories for each stage of life. We follow the characters of Tamsin, Ellie, Arun & Charlie. There are places where each of their lives intersect. Tamsin as a child was my favorite character, but Ellie as an adolescent was my favorite and then I wanted so MUCH for Arun to make different choices. In the beginning there is a lot of looking on the brighter side of life as a child often will, followed by much rebellion in the adolescent stages and led to mostly resignation as an adult with glimmers into the rebellions of youth. Joss has woven a political and spiritual tale of woe. This is a book that really makes you think about the world around you. I could see many past, current and future world events at different times throughout the book. The unique writing style was easy to follow and I enjoyed the interjected one liners of smaller happenings, such as the cats and the ants and the Mad Woman. I recommend this book for someone who likes to think deeply about life, but I will warn that there are some painful parts to read, especially Tamsin's adolescent chapter. Check this book out, solid 4 stars. Sign into Goodreads to see if any of your friends have read Occupied. 5.0% "intriguing start, definitely enjoying it so far"
15.0% "I Iike the way the characters are connected"
25.0% "so awful and sad what fear and hatred will make someone do"
60.0% "the adolescent chapters are painful to read"
It was very strange, a bit confusing in the beginning, but it was well sectioned out so that there was no confusion between characters and time periods.